My recent posts on the Bic Z4 Porous Tip pen have turned out to be very popular. People like this style of pen tip and the way they write, but unfortunately they are a little hard to find. The same goes for any similar pens, which is a question I have gotten several times recently. I was hard pressed to come up with an answer, but Pen Addict reader Amy sent me the Paper Mate Hardhead Flair to try out, and it is very comparable to the Z4. The Flair line has been around for as long as I can remember, but I had never heard of the Hardhead until Amy emailed me. Flairs have always been my favorite Paper Mate product, and this one holds up well under the test. The Hardhead has a sharp, dark line, and doesn’t bleed through the Doane Paper I am using. Compared directly to the Z4, it is almost identical, with only the smoothness of the Z4 being a bit better. Now for the kicker: These are even HARDER to find that the Z4. In fact, Amy got hers off of eBay, and was nice enough to share with me. Are there any other porous tip pen options out there that I should test and are somewhat easy to obtain? Please let me know in the comments section and I would be happy to hunt them down. 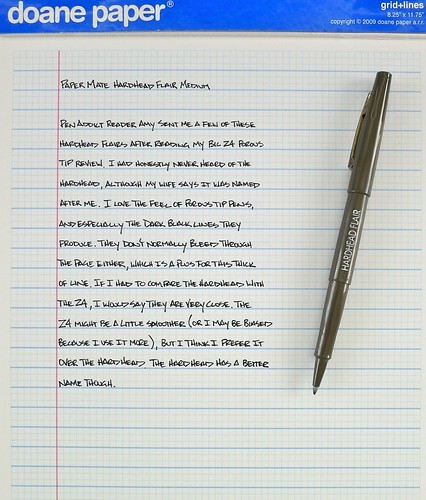 Posted on September 26, 2011 by Brad Dowdy and filed under Bic, Hardhead, Paper Mate, Pen Reviews, Porous, Z4.